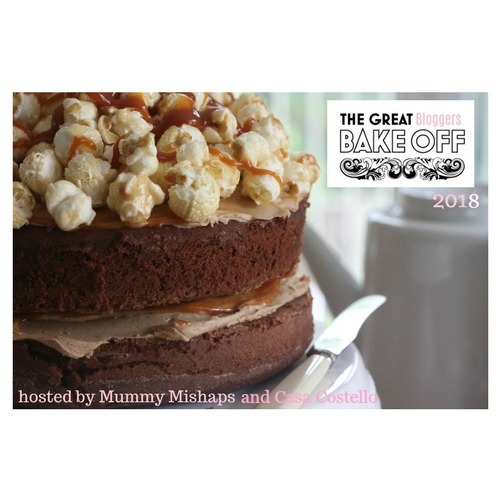 I can't believe that GBBO 2018 is coming to an end - which means that sadly #gbbobloggers2018 is also coming to an end. Yet I'm really pleased that I've managed to bake along every single week thus far. 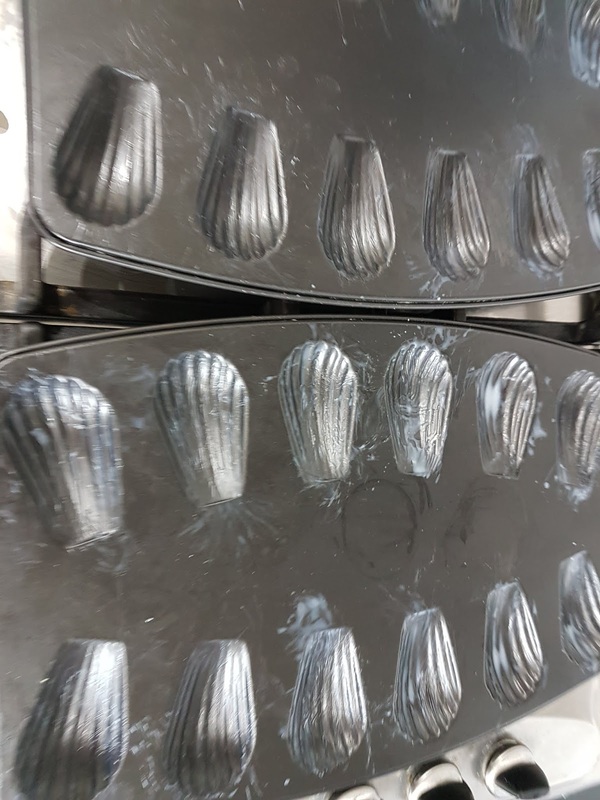 When I saw that the signature challenge was madeleines I fist pumped the air because unlike last week's aebleskiver, this week I did actually own the right type of baking vessel needed for madeleines. A few years ago I bought 2 Madeleine tins which you can read about here and I attempted madeleines a couple of times until I had succeeded in making them. So it was very tempting to reblog that recipe for this week's bake along. But I actually wanted to get more use out of the madeleine tins as I haven't used them since then. 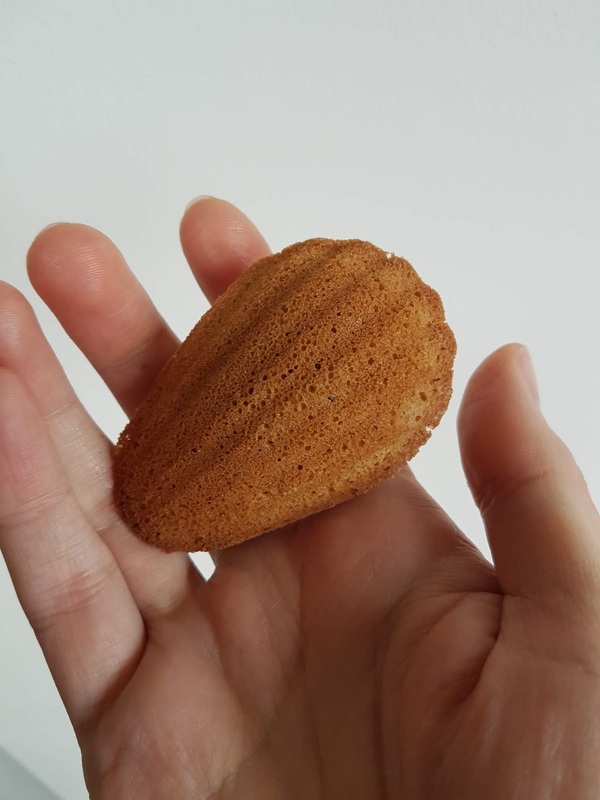 So I decided to make a new batch of madeleines and I really wanted to see if I could create a recipe that was gluten free and refined sugar-free. I made a last minute decision to use coconut oil in place of butter too so they also happen to be dairy free. Freeze dried raspberry pieces to sprinkle on top. Roasted chopped hazelnuts to sprinkle on top. 1. Whisk together the eggs and the coconut sugar until thick and a little fluffy. It is harder to tell when it is ready as the coconut sugar gives it a light brown colour. With regular caster sugar it would ordinarily turn "pale and fluffy". 2. Carefully fold in the flour and baking powder then fold in the coconut oil. 3. 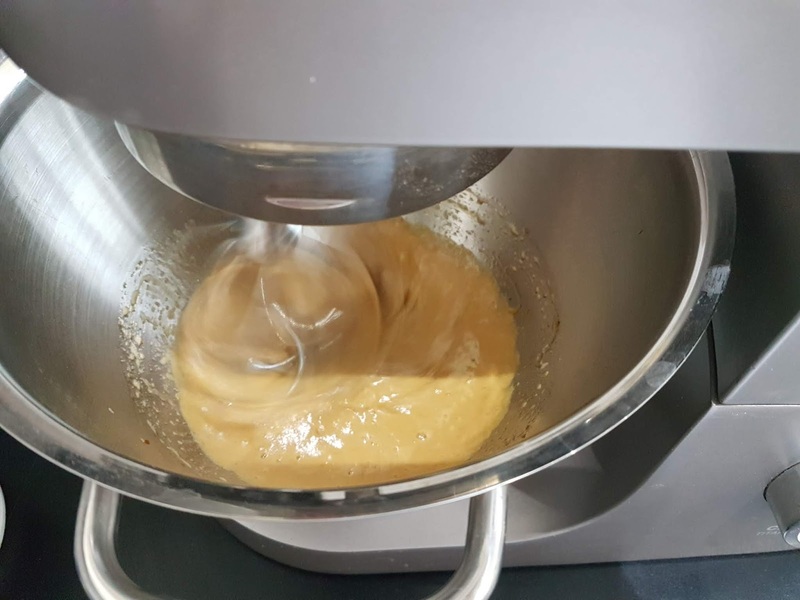 Knowing how important it is to chill the mixture after my previous experience of making madeleines I placed the bowl of batter in the fridge. Probably for around half an hour. I began to preheat the oven to 200C at this point. What I had discovered before was that the madeleines worked better when the batter was placed in the madeleine tins and chilled in the freezer for a short while before cooking. However there was no room in my freezer to do this today. I was also conscious that coconut oil solidifies very quickly when chilled so I didn't want to risk the batter becoming solid. So the short time the batter had in the fridge worked fine. It is a pretty cold day today so as I greased the madeleine tins with melted coconut oil, I noticed that the oil was solidifying. I dusted the trays with a little gluten free plain flour then gave each one a short chill in the fridge before adding the batter to them. 4. 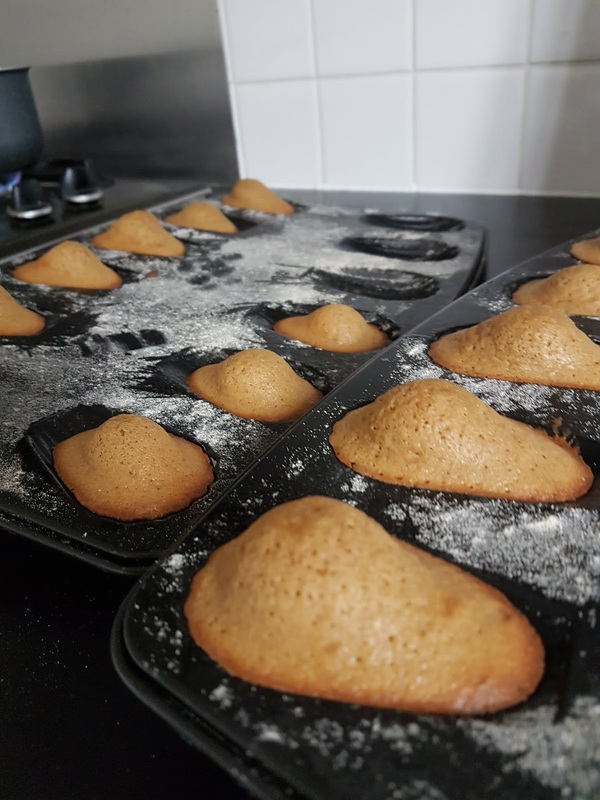 I placed approximately a teaspoon of the batter into each of the scallop shaped wells in the tins. 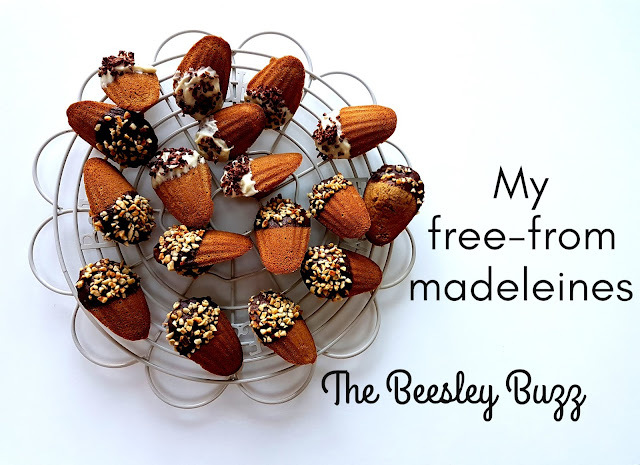 I had enough batter for 21 madeleines. It is really important not to overfill them as they do expand and so you don't want them to overflow and lose their shape. 5. Place in the oven at 200c for 6-8 minutes. It can be tricky to see when they are done as both the flour (being a lovely wholesome free from flour from the Free From Fairy) and the coconut sugar both make this a brown-looking bake. So I used a skewer to test when done. 6. I was thrilled that I got the scallop imprint AND a bump! I cooled them on a cooling rack whilst making the chocolate. 2. Once the cacao butter has melted remove from the heat and add 40g of set honey, a sprinkle of vanilla powder and a pinch of Himalayan pink salt. Mix well. 3. Add 60g of coconut milk using mainly the thick creamy part from a tin of coconut milk. 4. Divide the mixture into two. In one half add 15g of cacao powder. This will become the milk chocolate. I also found this needed a bit more coconut milk - approximately another 40g added to it. 5. 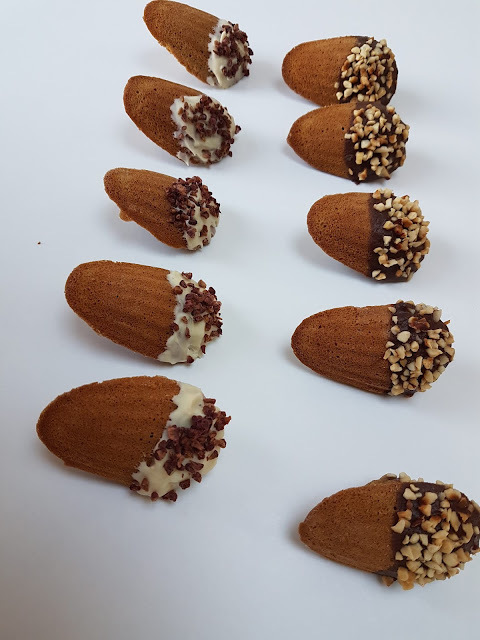 As it was a cold day I found my chocolate was quickly solidifying before I had dipped my madeleines. If this happens, it can be easily re-melted using a bain-marie. 6. I dipped the madeleines in the chocolate - some in the milk chocolate and some in the white chocolate and sprinkled with roasted chopped hazelnuts and free-dried raspberries respectively. Then placed them on baking paper for the chocolate to set. 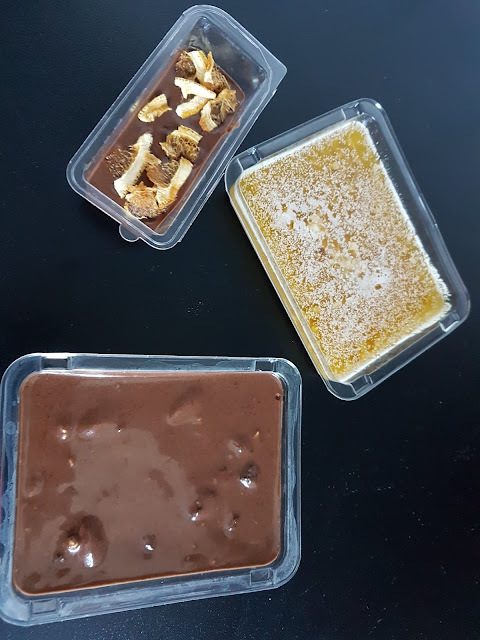 I had lots of spare chocolate left so poured it into little plastic moulds to make some chocolate 'bars'. I'm used to eating bakes made with alternative flours and alternatives to sugar so to me they tasted great. 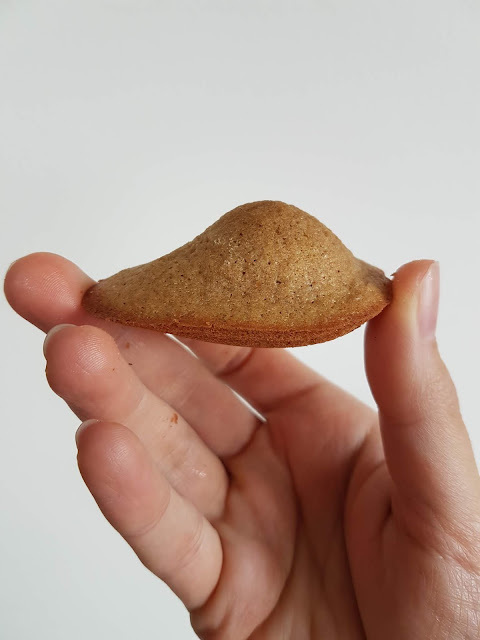 But the kids said they would prefer normal madeleines. They did taste a teeny bit 'dry' so would be perfect with a jam, coulis or curd to eat with them for added moisture. 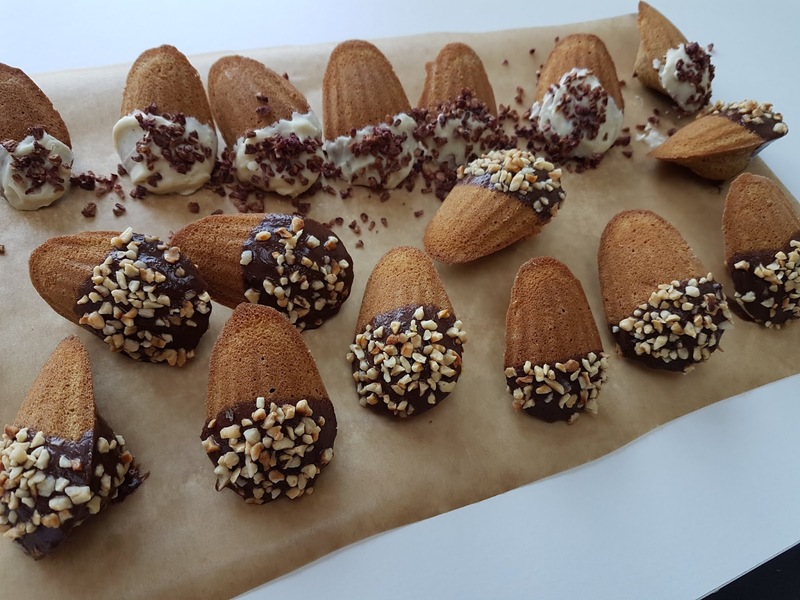 Or if you're not too worried about sugar content then a drizzle made with icing sugar in place of the chocolate would probably add more moisture to them. Overall I was thrilled with how they turned out because I had no idea if this recipe would work as I made it up as I went along! 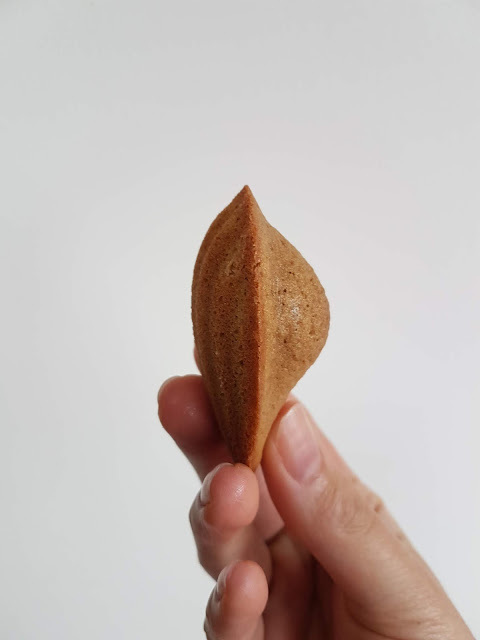 OMG your madeleines look fabulous and a perfect hump too. Mine were merely rounded it. 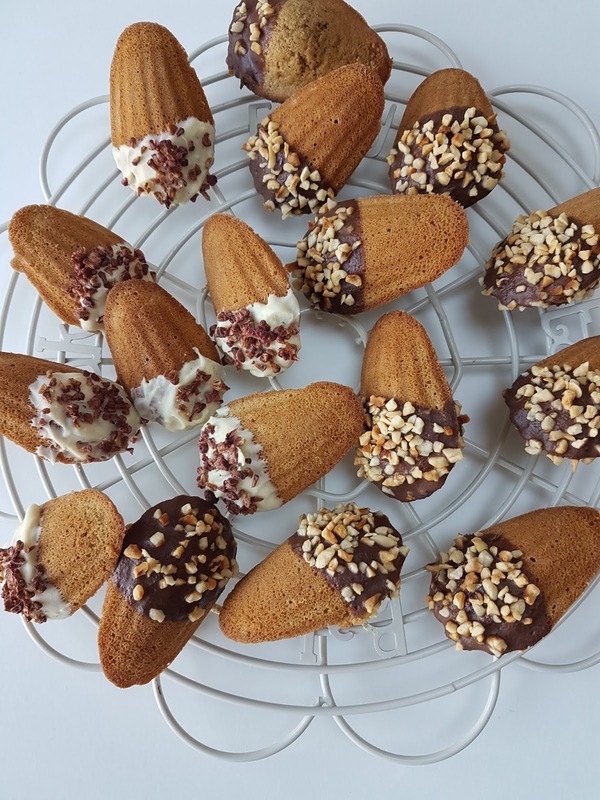 Your madeleines look great. We need to buy some tins because I really want to try making some. Ha ha yes I see what you mean about it looking like it's free from fairies! - what i meant is the brand of gf flour I use is called "the free from fairy" . Vicki who blogs at the blog by that name created the flour herself and it is brilliant.